WEST POINT, MS – Mossy Oak is proud to announce its partnership with Buck Bone Organics. 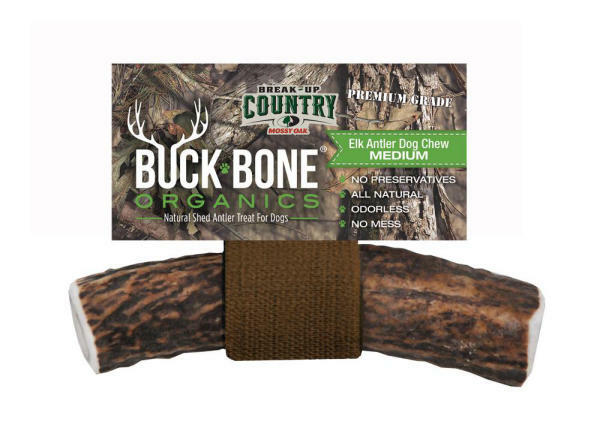 Buck Bone Organics is a fast-growing company taking the dog world by storm with their all-natural dog chew antlers offered in Mossy Oak Break-Up Country packaging. Each season, the people of Buck Bone Organics hand pick the freshest and finest sheds from the Rocky Mountains, guaranteeing their antlers are a Domestic USA product with Grade A Quality. They are handcrafted—cut, sanded, and wrapped with love. The antlers are full of nutrition with no growth hormones, antibiotics, or preservatives, providing an excellent source of calcium, phosphorus, and protein for your dog, satisfying their need to chew! 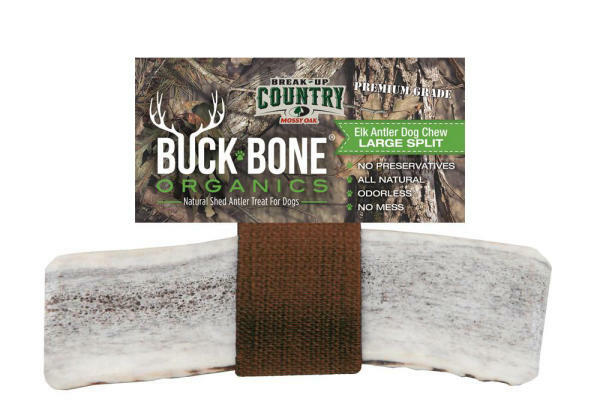 Buck Bone Organics offers a variety of sizes ranging from Small to X-Large with two different cuts, “Whole” or “Split.” Typically, Whole antlers will last longer and will be a harder chew than our Split Buck Bones. The Split antlers have exposed marrow, making a softer chew and are recommended for dogs that have less aggressive chewing habits. Currently, the products in the Mossy Oak packaging can be purchased online at www.buckboneorganics.com. To learn more about Mossy Oak, or to enjoy free, timely and entertaining hunting and outdoors content, visit https://www.mossyoak.com. Buck Bone Organics is an official licensee of Haas Outdoors Inc. Established in 1986, Haas Outdoors Inc. is headquartered in West Point, Miss., and is home of Mossy Oak. For more than 30 years, Mossy Oak has been a leading outdoors lifestyle brand that specializes in developing and marketing modern camouflage designs for hunters and outdoors enthusiasts. The Mossy Oak Brand and patterns can be found on a multitude of products worldwide. Haas Outdoors Inc. is the parent company of Mossy Oak, BioLogic, Capture Productions, MOOSE Media, Nativ Nurseries, Nativ Living, GameKeepers, GameKeepers Kennels and Mossy Oak Properties. Mossy Oak is the official camouflage of the National Wild Turkey Federation, Ducks Unlimited, Quality Deer Management Association, and Mack’s Prairie Wings and the official pattern of B.A.S.S., MLF and Cabela’s Collegiate Bass Fishing Series.